People brush, floss and receive regular dental cleanings to maintain healthy teeth and gums and to prevent tooth loss. Preventative dental care is just as important for our pets. Without appropriate care, plaque and bacteria will build up on the teeth and above the gum line. Over time, this plaque will harden into calculus (tartar). As the calculus becomes thicker, it will start to cause inflammation of the gums (gingivitis), and they will start to recede and pull away from the teeth. This allows bacteria and debris to move further above the gum line. As periodontal disease progresses, the teeth can loosen and abscesses can develop. Chronic disease can even lead to weakening of the surrounding bone, making the jaw more prone to fractures. Periodontal disease is painful for pets and can interfere with eating, but the associated bacteria can also cause problems. Bacteria can enter the bloodstream and affect internal organs, such as the heart, liver, and kidneys. Taking care of our pets’ teeth will help them live longer, healthier, happier lives. Regular brushing is the best way to maintain a healthy mouth. Daily brushing is ideal, but even doing it a few times a week is better than nothing. With dogs and cats, only the outer surfaces of the teeth need to be brushed, which makes it a little easier. There are multiple types of brushes available, including one that slips over the finger. Only toothpaste specifically formulated for pets should be used. When first starting out, using only your finger to rub along the teeth and gums can help your pet get used to the feeling of have their teeth brushed. Starting when your pet is young also helps. There are treats designed to help prevent plaque build-up, but they should be used as a supplement to brushing rather than replacing it. Bones and hard chew toys for dogs should be avoided, as they can cause tooth fractures. A yearly physical exam is also very important to assess your pet’s dental and overall health. Your veterinarian will check the teeth, discuss any issues, and determine whether your pet will need a professional cleaning under anesthesia. Some pets may need a cleaning every year or two, others only once or twice in their lifetime. Genetics play a role in dental health, so even with appropriate care, some pets will need more frequent professional cleanings. 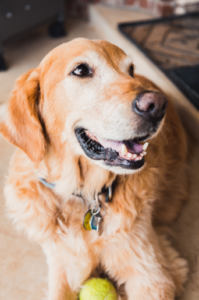 It is never too late to get started with a dental hygiene regimen for your pet. Our veterinarians are happy to provide you with insights and additional guidance. Contact us today to schedule a visit. It’s finally spring! To some people this might mean that all the snow melted and they now have lots of poop scooping to catch up on in the yard, but it also means nicer weather for more walks with your dog. Going on walks regularly with your dog provides many physical and mental health benefits that help to keep you and your dog loving and living the good life. Below are helpful pet safety tips we recommend to keep you and your dog safe on those beautiful spring strolls. Make sure your dog is wearing an appropriate fitted collar or harness. You don’t want to find out the hard way that the collar was too big and your beloved pet slipped out while trying to chase a bicycle or squirrel. Use the “two finger” rule by sliding two fingers between your dog’s neck and collar to make sure the collar is not fitted too snug or too loose. You should not be able to pull the collar up and over the dog’s head. Remember that dogs grow, lose weight, and gain weight just like people do, so it is important to frequently check how your dog’s collar fits and also that it is in good condition. Harnesses are also great options for smaller breeds and brachycephalic breeds (short nose dogs like pugs and bulldogs) with delicate windpipes. Harnesses can discourage pulling, provide better control, and prevent injury to the neck area. There are MANY different kinds of harnesses, so do your research or work with a professional trainer to identify which harness is best for you and your dog. Retractable leashes are generally not safe and are not recommended. Retractable style leashes provide little control and often extend very far, which can be dangerous if you’re near roads or other animals who are not pet friendly. The cord on these leashes are not durable and can snap or easily tangle around the walker or dog and cause serious injury. Talk to your veterinarian or trainer before making the decision to purchase a retractable leash. Head collars can be a good option for certain dogs who are having difficulty pulling on leash, but if you are looking into this option it is recommended to work with a trainer or veterinary professional to help you acclimate your dog to this style of head harness. Dogs tend to either respond really well or face challenges adjusting to the “funny thing” on their face. Most places have laws stating your dog needs to be on leash, and for your dog’s safety it is very important to follow this rule. Even if you have your dog well trained you never know what could scare or spark your dog’s interest and cause them to take off, which puts them at risk of getting hit by a car, in a fight with another animal, or lost. Use designated dog parks that are fenced in for off leash play. Not only should you have properly fitted collars and harnesses, but your dog should also have proper identification in the chance they do get loose on your walk. Identification tags with your pets name, your phone number, and city can increase the chance of you reuniting with your pet. In addition, it is highly recommended to get your pet microchipped, which involves a very small chip being inserted under the skin and between your pet’s shoulder blades. This chip has a unique number which is detected by a microchip scanner and entered into a database. Visit HumanePA.org to learn more about the benefits of microchips and our free microchip clinics. Most shelters, veterinary hospitals, and even police officers carry microchip scanners and can scan a stray animal brought to them. Having your pet’s current rabies tag, license tag, microchip tag, and identification tag are all beneficial and increase the chance of your dog being reunited to you. Make sure you have poop pick-up bags ready because most cities will issue a fine if you do not clean up after your pet. If you are going on a longer walk or hike it may be good to bring water and treats with you so your dog can stay hydrated and energized. Watch the weather and lighting when you go on your walk. Dogs can easily overheat and even moderate temperatures, like 70 degrees, can cause heat stroke depending on the circumstances. Be mindful of your dog’s coat and tolerance to heat. Check with your vet if you are not certain what temperatures you should avoid for walk days. If you are walking very early or very late, make sure you are seen. Put reflective gear and clip on lights that will make you and your dog stand out to a passersby. Play it safe and stay on sidewalks. Just like when you pop in that new Jillian Michaels DVD to tone in 30 days, Jillian recommends you consult with a doctor or medical professional to ensure you are healthy enough for exercise. The same goes for your pooch. Regular vet visits can make sure that your dog is in sound condition to accompany you on walks. Regular vet visits also mean getting routine vaccinations, which can protect your dog from catching diseases. This goes both ways. 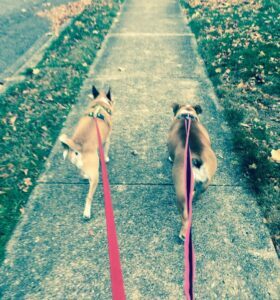 If you are walking your dog and see another dog walking by, ask before approaching to let the dogs meet. The other dog may be dog aggressive or be working on their confidence with other dogs, but not quite ready to meet other dogs. Don’t ever assume. Be alert for people who do not practice the “ask before approaching” rule with or without dogs. 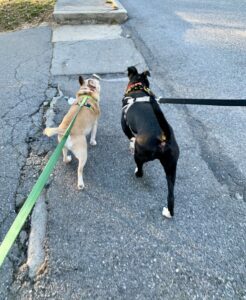 Over the weekend I had two very different interactions when my husband and I were walking our two dogs. The first involved a young child running full speed at my 8 year old pug mix in full Frankenstein fashion with arms stretched out far in front and wide eyes. She was clearly excited and had one goal in mind, to touch the dogs. The child’s parent was nearby and not once intervened. The child approached so quickly my dog snapped at her because he was terrified by the quick approach of a stranger. Thankfully there was no injury or contact. This was not the child’s fault, but the lack of supervision or interference from the parent. In another situation three children were riding their bicycles and asked from across the street if they could pet my dogs. My dogs are friendly dogs, with the right approach, so I said yes and the children came over slowly and crouched down and offered a hand to sniff. Both dogs were presenting bellies and giving kisses galore. They welcomed this respectful approach. Two different approaches and two different outcomes. Supervise and teach your children appropriate interactions to avoid incidents. If you don’t know confidently how your dog will react in different situations, don’t chance it by allowing strangers to approach. 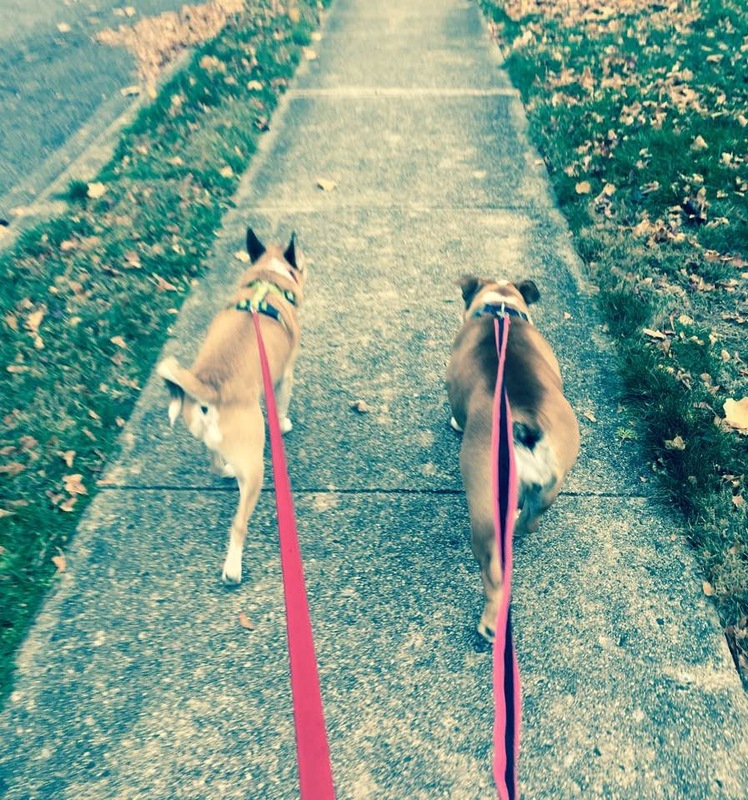 Walks are a great way to bond with your dog and get some fresh air. Follow these helpful tips to make sure you are protecting yourself and your dog every time you leash up. Next time you ask your dog, “Wanna go for a W.A.L.K?” remember to keep it S.A.F.E. Does the Imperious Curse Work on the Internet? If you haven’t yet purchased your 2019 Art for Arf’s Sake Auction tickets yet, you really should. This year will be a blast. 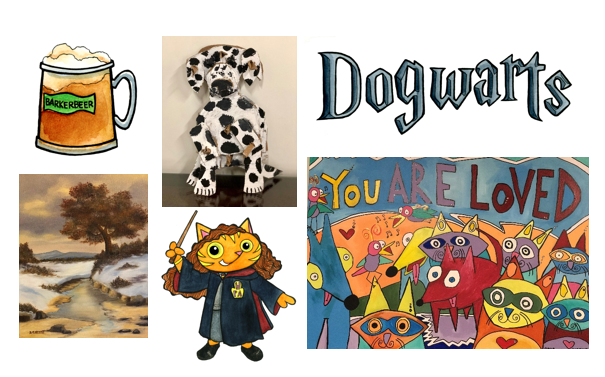 You just know our staff and auction committee are going to manage some magical surprises with our Harry Pawter theme (that’s right, Pawter. Not only is that cute, but we don’t want to find out how litigious J.K. is). Think of our Dogwarts as Hogwarts’ less prestigious party school alternative. We are back at the old Rajah Theater, now the Santander Performing Arts Center, which is tailor made for this theme. We will have food, drink, and entertainment, featuring the Dogwarts House Student Band. 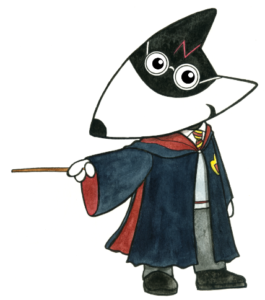 You’ll get sorted or pick your own house, and if your house bids enough, maybe you’ll take home the Dogwarts Cup. Through an unspeakable act of sorcery – or just because we have so much more room than we did at the last venue – we have cast a shrinking spell on the ticket price. It’s only $40 a person! You’d have to be crazier than a Bellatrix to think you can find a better deal for a night of food, open beer and wine bar, and the chance to see Humane Pennsylvania staff dressed up and making fools of themselves. For just a little more, you can become a patron-us (get it?) and get a pair of VIP passes for both the art auction and the Portkey Preview Party at the home of honorary event co-chairs, John Herman and Lisa Tiger, in Wyomissing on Friday, April 12. You will be joining local artists and luminaries in supporting the spectacular and unique work of Humane Pennsylvania. 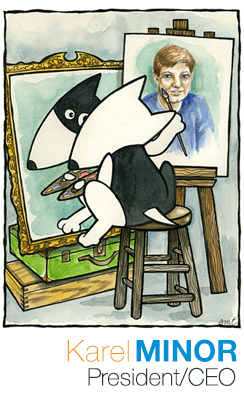 We’ve also got some better known folks, too: Betsy Lewin, Caldecott Honor winning illustrator of such books as “Click, Clack, Moo”, and legendary west coast punk icons Chris D. (The Flesh Eaters), John Doe & DJ Bonebrake ( X), Steve Berlin (Los Lobos), and Dave Alvin (The Blasters), have personally donated pieces in support of this year’s auction! So I need you to do something for us. If you haven’t yet bought your tickets, do it right now! If you have bought your tickets, help us reach our goal of 100 new recruits and bring two guests with you! The success of this event directly determines our ability to deliver critical life-saving animal welfare and medical service in Berks and Lancaster Counties. Check out our website to see some of the awesome art, items, and experiences featured at the art auction the April 27. Now, let’s see if this works. With tap of my wand and a flourish of my hand, I command, “Imperious!” Now go buy some tickets, you are under my control.